Liv Ullmann, Sam Waterston, John Heard, Ione Skye. Somehow it happens. A conversation begins, then the magic of interaction and the fever of ideas take over. The next thing you know, your train stop is miles back. Or the restaurant is empty and the waiter is gone. Or the sun seeps into your dorm room. You’ve taken a Mindwalk. You’re different than when you began. 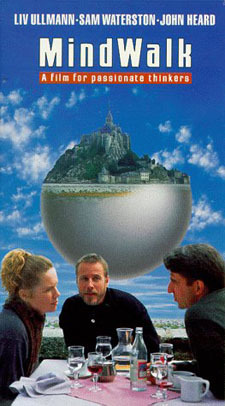 In this acclaimed film set on the impressive island-abbey of Mont St. Michel, Sam Waterston (The Killing Fields), Liv Ullmann (Persona) and John Heard (Home Alone) portray very dissimilar vacationers caught up in the spontaneous and life-affirming sweep of self- expression and new ideas. Mindwalk with them. Experience “the most literate and stimulating cinematic talk session since My Dinner With Andre” (John HartI, Seottle Times). The Atlas Production Company presents in association with Mindwalk Productions. A film by Bernt Capra. Starring Liv Ullmann, Sam Waterston, John Heard “Mindwalk” Ione Skye. Director of Photography: Karl Kases. Edited by Jean Claude Piroue. Based on the Book “The Turning Point” by Fritjof Capra. Screenplay by Floyd Byars and Fritjof Capra. Production Executives: Faramarz Ettehadieh & Gert Oberdorfer. Produced by Adrianna AJ Cohen.